Pre-Prep had a terrific surprise today when Father Christmas visited during playtime. 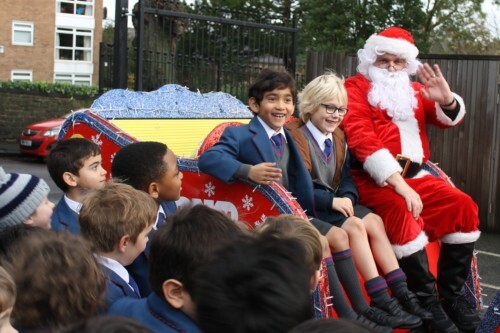 There was great excitement when some boys noticed a colourful sleigh being driven down Clarke Drive. Everyone gathered on the decking as we cheered to see Father Christmas arrive. To the delight of the boys, a Christmas Elf invited them to clamber up onto the sleigh next to Santa. The boys waved happily to their class friends and enjoyed a photo opportunity. At the end of the visit, the boys gave their thanks for the delicious candy cane left by Santa, for our ‘Good boys’. The teachers wish to thank everyone at City Cars for making this lovely festive visit possible.